Two conservative FCC commissioners want the vote delayed until the end of March. The FCC is due to vote on the commission's net neutrality plan later this week, but two of the commissioners at the agency want to see the vote delayed by 30 days. FCC commissioners Michael O'Rielly and Ajit Pai asked for the vote delay via an FCC press release, and say the delay is crucial as "...the future of the entire Internet at stake." Along with a vote delay, O'Rielly and Pai want the FCC's full report on new open Internet rules released to the public. "We respectfully request that FCC leadership immediately release the 332-page Internet regulation plan publicly and allow the American people a reasonable period of not less than 30 days to carefully study it," said the commissioner duo in a statement today. "...after the Commission reviews the specific input it receives from the American public and makes any modifications to the plan as appropriate, we could proceed to a final vote." 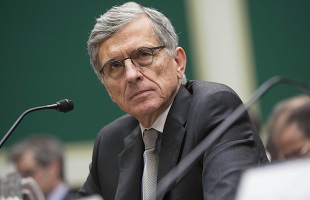 FCC chairman Tom Wheeler's full 332-page proposal has not been seen by anyone outside of the FCC, which instead released a truncated summary of the proposal on its website. Commissioner Pai released a statement earlier this month calling for the release of the full report, saying chairman Wheeler's plan was really "President Obama's 332-page plan," suggesting that Wheeler's plan came from the office of the President. "Instead of allowing the American people to choose the broadband service plan that is best for them, the President's plan places that decision in the hands of a Washington bureaucracy," said Pai. While chairman Wheeler has not issued a formal response, he did take to his Twitter account today, saying "[The] FCC received more than 4 million comments on #OpenInternet during past year that helped shape proposal. It's time to act." Based on that response, the odds of a delay being approved don't appear favorable. So is this a legitimate push for transparency by some of the FCC's commissioner membership? Not necessarily. The Republican-controlled Congress has net neutrality ideas of its own, so a delay could give the legislative bodies the time they need to pass their own set of laws and regulations. Even if the vote isn't delayed and proceeds as planned, you can be sure this isn't the end of the debate, both for Congress, and the FCC.